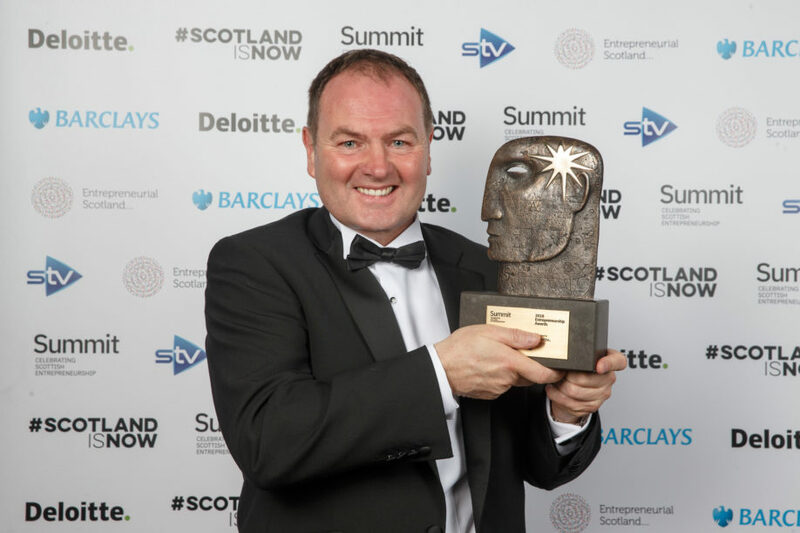 Designed by STV and Entrepreneurial Scotland to honour our most inspirational established and up-and-coming entrepreneurs, from a range of backgrounds and sectors, the prestigious awards highlight the breadth of Scotland’s entrepreneurial talent. The 2018 Summit Entrepreneurship Awards are supported by Deloitte, Barclays and Scotland is Now. This year’s awards are also organised in collaboration with the Scotland CAN DO movement. Entrepreneur of the Year was awarded to Derek Pierce, Managing Director of J&D Pierce Contracts, one of the largest structural steelwork contractors in the UK. The company was established in 1975 in Glengarnock, North Ayrshire, providing light fabrication and general blacksmith work. Today, J&D Pierce, employs 350 staff across six divisions and has been involved in prestigious projects including Aberdeen Exhibition and Conference Centre, Glasgow Queen Street Station redevelopment and Gatwick Airport’s new hanger for Boeing. Scale-Up Entrepreneur of the Year was awarded to Steven Gray, CEO of ROVOP. Steven established the remote operated vehicle (ROV) venture in Aberdeen in 2011, building it into a leading player in the oil, gas, offshore wind, telecoms and power transmission industries. ROVOP now has 51 ROVs and 200 staff in Scotland and the US. The company’s global client base includes customers in the UK, EU, Middle East, US, and South America. Eighteen-year-old student, Isla Leslie, MD of Estrela, Kirkwall Grammar School’s 2017/18 Young Enterprise team, was named Young Entrepreneur of the Year. The awards were established to showcase the impressive range of Scotland’s entrepreneurial talent across a mix of industries and sectors, and to shine a light on the people who are creating and growing our most successful enterprises across our private, public and third sectors. Hosted by broadcaster, Rona Dougall, the awards night at SWG3, was the culmination of a rigorous review of more than 250 nominations to determine the finalists in each of the seven categories. The expert judging panel included some of Scotland’s most successful entrepreneurs.